A motorcycle fork stem mount fits the steering stem hole in the top triple clamp assembly. This is a popular location for a smartphone unit as it is easy to see and doesn’t take up any handlebar space. This is especially useful for motorcycles that do not have a traditional handlebar. Typical mounting procedures call for inserting a stem accessory which is manufactured specifically for this location. Some stem mounts are made of multiple parts and are fastened with machine screws into the stem. Other stem mounts are manufactured of a thick rubber component and the mount is twisted tightly into the stem hole. Be sure to read the manufacturer’s instructions carefully prior and during installation to ensure that the mount is installed properly and securely. 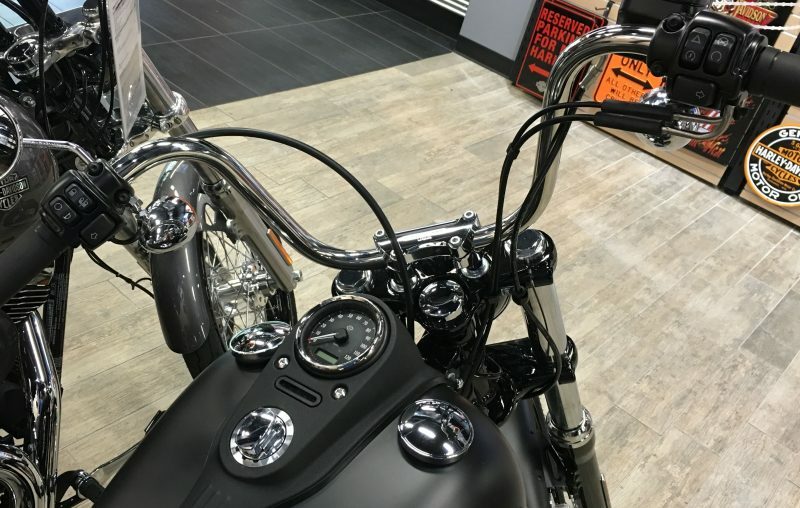 These mounts aren’t too difficult to install but if you do not feel comfortable working on your motorcycle, your local motorcycle mechanic is a good resource. There are only a few manufacturers that we know of that manufacture a stem mount. Be sure to first get a measurement of your stem diameter to ensure that your new mount will fit. You will need that measurement to customize the mount prior to installation. TechMount has an excellent cradle called the Techmount TechGripper. It’s a spring-loaded cradle that opens to four-inches. Four inches is large enough for most smartphones with or without a case or skin. This includes my new giant Apple iPhone 6s Plus. The reason that i like this is the tight closure on the cradle. When closed, this cradle provides a very strong hold on your device. The back of this cradle has a socket which snaps onto the 17mm ball that is part of most Techmount mounting kits. The Techmount Stem Mount Kit with TechGripper pairs this cradle with a series of different attachments to fit the stem hole on your motorcycle. The universal stem mount system comes equipped with six fork stem shafts with varying diameters, each being a different diameter to fit virtually all-steering stem holes. Select the right size for your stem and slide it down into the top of the fork steering stem. The stem adapter includes an O-ring, which progressively gets tighter as you slide it into the stem shaft. RAM has their own excellent cradle called the X-Grip. These cradles come in several sizes so be sure to pick the one that will fit your smartphone. These cradles are made of metal and heavy plastic and come with a lifetime warranty. A well made cradle that now includes a safety tether as added security for your phone. The RAM X-Grip IV Cradle is my new favorite as it fits phones up to 5.75″ wide. The RAM Fork Stem Mount with X-Grip IV Cradle includes a cradle large enough to hold almost any smartphone including my iPhone 6s Plus. These mounts come with a single ball assembly and you will need to do some trimming to customize the fit to your fork stem diameter. The mount includes the one inch ball that is universal to most RAM Mount systems. A three-inch arm connects to the included cradle and the phone within the X-Grip can pivot and swivel 360 degrees. There are ball and socket pivot points at the base and the tip of the mount. Be sure to measure carefully before trimming the cone on the stem attachment as you only get one chance to do this right. We always like to recommend use of a tether whenever using a device on a motorcycle. You can read more about motorcycle tethers here.